Made with the solar Christmas lights, you can build any shape you like, shaped around plants, signs, furniture. 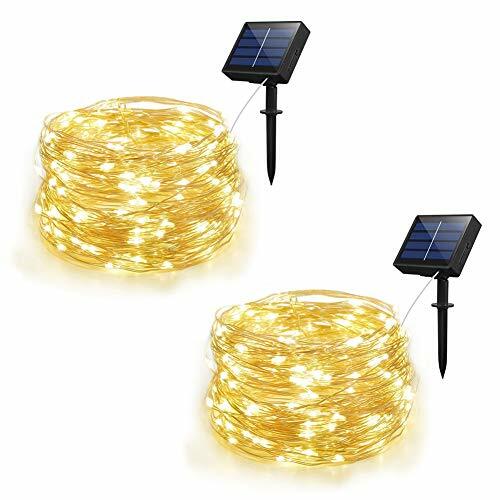 With 33 feet of miniature warm white LED, you can beautify and decorate your life and garden with solar rope lights outdoor, and adding romantic atmosphere to your home, pool parties, wedding, etc. 4.Due to long time shipping, if the outdoor Solar string light don't light up in the dark, please turn on the switch and place the lights in the sun and get a few hours of sunlight. If you have any problem, please email us freely! 2 SWITCH BUTTONS & 8 LIGHTS MODES - Power ON/OFF, Auto on at dusk, Auto off by day; 8 MODES (Combination, Fireflies, Waves, Fading, Chasing, Fading slowly, Twinkle/Flashing and Steady on), you can choose your favorite modes based on different occasions. WATERPROOF & HIGH QUALITY - Both the decorative string lights and solar panel box are Water Resistant, Ideal for decorating your patio garden wedding party; And the light is durable, can provide a long-term use, each led can illuminate for at least 10000 HOURS. If you have any questions about this product by Adecorty, contact us by completing and submitting the form below. If you are looking for a specif part number, please include it with your message.